John Calvin was born in France in 1509. 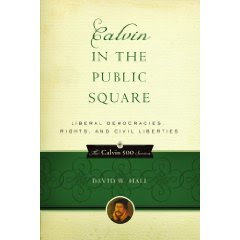 Having thus reached a major historical milestone, P&R Publishing is in the midst of printing a number of works as part of their Calvin 500 Series, of which Calvin in the Public Square , by author and series editor David W. Hall, is a part. 1. If you love to read about history, you will love this book. 2. If you love to read about politics, you will love this book. 3. If you love the story of America's Road to Independence, you will love this book. 4. If you love the study of Calvin's life and thought, you will love this book. 5. If you love Martin Luther, you will love this book. 6. If you love the Scottish Covenanters, you will love this book. I really and truly enjoyed this book . . . and not just in a geeky way (though that probably was a factor). Pastor David Hall has a very readable style that seemlessly integrates relevant, revealing, and compelling quotations from all kinds of sources. I found the chapter on Calvin and Poverty to be one of the most compelling, as it presents a wise and Biblical model by which Christians and the Church can (and historically has) provided for the needs of the poor, the sick, the widows, orphans, and outcasts in their communities. It is a model we would do well to reclaim and put to good use once more. In terms of an ideal audience, I believe this book can be appreciated by mature Christians of any age who are concerned about how their faith can effect all of life. I hope that you will get a copy of this book and read it, and that it will be a blessing to you as it was to me. For some lighter fare concerning John Calvin, see Christopher's review of The Betrayal: A Novel on John Calvin. I'm going to be honest. This sounds like a book I would never pick up. But your review makes me want to pick it up. I think that I would see it in the book store and pass it up not really understanding what it was about. But you pointed out that there are a lot of really interesting things in the book. Thanks! I think I am going to have to buy this book for my brother, who was named after this reformer. I think he will really enjoy it! (And, then I can borrow it back from him so I can read it too!) My brother Calvin, is reading through the Reformer's 'Institutes of the Christian Religion' right now...and this book sounds like it would be a great accompanyment so you could get to know the life of John Calvin as well as his thoughts and heart. Thanks for sharing this book with us!